The 1kg feeder is suitable for up to 10 chicks. 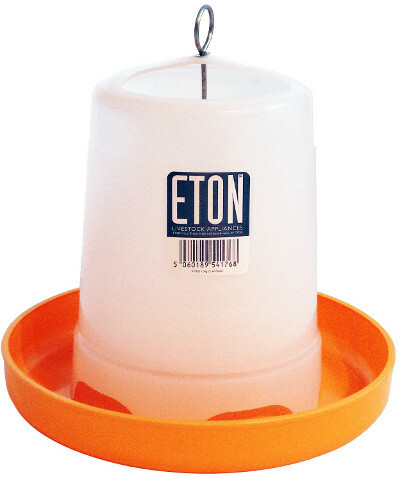 The 3kg is suitable for up to 30 chicks or can be used as a budget feeder for up to 6 birds providing 3 days of feed. Both feeders can be hung but they have a shallow trough more suitable for floor use for small chicks. The 1.5kg is suitable for 10 chicks floor standing or 3 mature hens hanging. 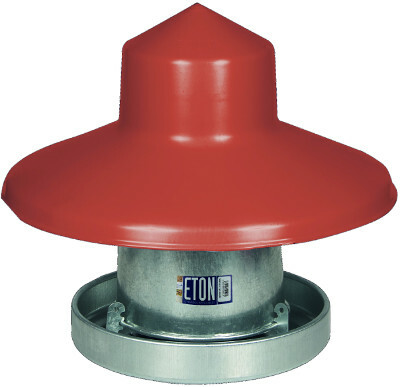 A robust small feeder suitable for back garden situations where space is at a premium. This feeder may require topping up daily. The 3kg feeder holds enough feed for 20 bird days is suitable for up to 6 hybrids for 3 days. 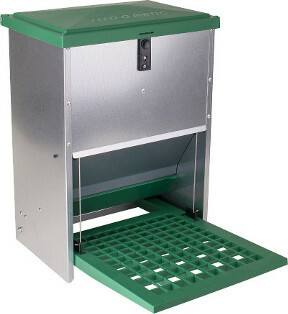 This feeder is adjustable and is suitable for pellets or mash. The 1kg is recommended for up to 10 chicks. The 1.5kg is recommended for chicks and bantams and up to 3 hybrids if space is at a premium. While it holds enough feed for more mature birds (10 bird/days for hybrids) it may prove unstable. if used with mature birds it is best wedged in a corner of the coop. The 3kg holds enough feed for 20 bird/days (hybrids) and is recommended for up to 6 hybrids (3 days). The 5kg holds enough feed for 33 bird/days (hybrids) and is recommended for up to 10 hybrids (3 days). It should be stable enough for most heavier chickens. 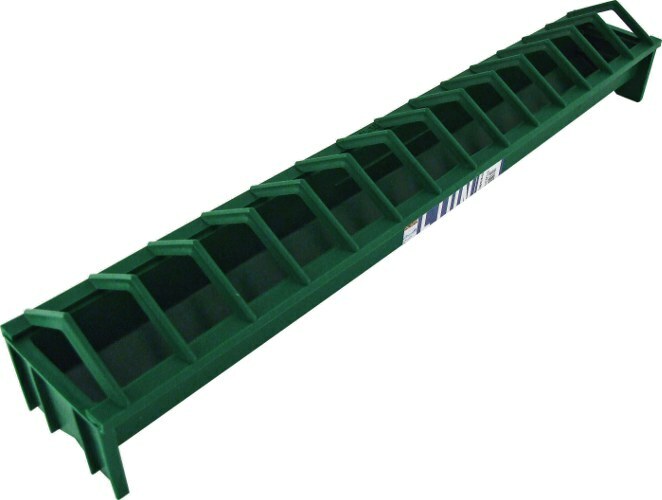 It is recommended that all the BEC feeders are raised off the ground to prevent contamination by placing them on Bricks or a suitable stand. The Ascot feeder is a very versatile feeder that is suitable for all classes of mature chickens. 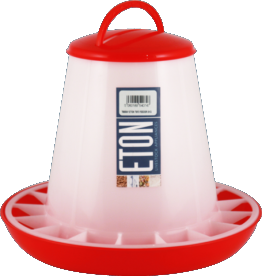 Both the indoor and outdoor version come with a lid anti-flick fins and handle which can also be used to hang the feeder off the ground. Legs and rain hat are included with the outdoor version, or can be purchased separately for the indoor version. The Ascot will hold enough feed for 16 bird/days (hybrids) and is recommended for up to 8 hybrids (2 days) or 4 heavy breeds. The Blenheim feeder is a very versatile feeder that is suitable for all classes of mature chickens. Both the indoor and outdoor version come with legs, lid and handle which can also be used to hang the feeder off the ground. Both versions have fins in the feeding trough to help prevent feed being flicked on the floor. The outdoor version includes a rain hat. The Blenheim will hold enough feed for 40 bird/days (hybrids) and is recommended for up to 12 hybrids (3 days) or 8 heavy breeds. 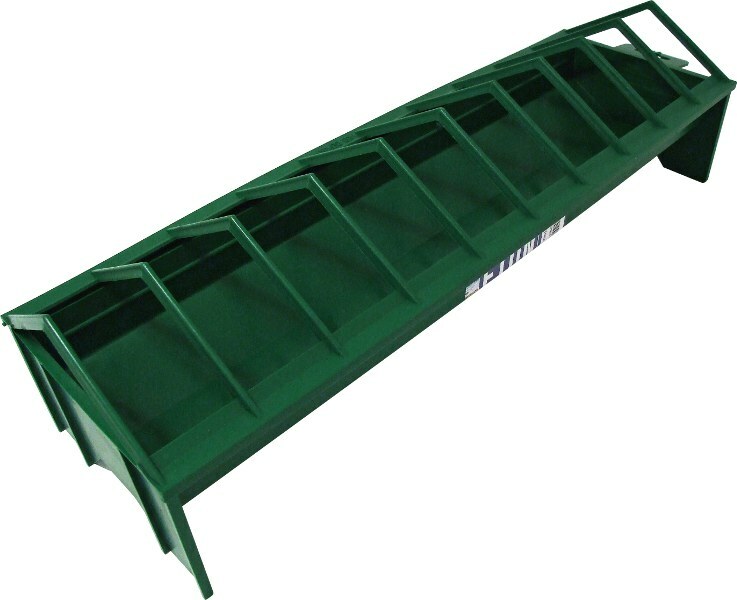 Robust, moulded plastic feeder with grid. Suitable for chicks from 1- 6 weeks old. 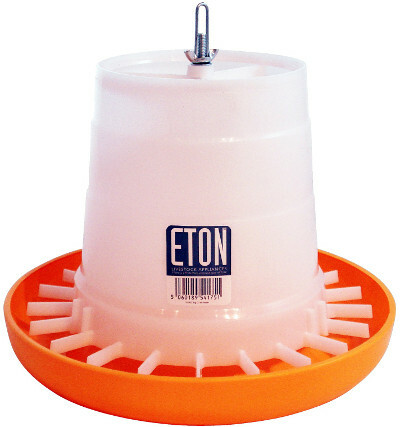 Robust, moulded plastic feeder. Suitable for up to 10 mature chickens for 1 day where space is at a premium. A linear chick feeder made from tough resilient plastic. Suitable for up to 18 chicks from 5 days to 4 weeks old. It has a hinged lid making it easy to clean and an anti-perching bar. 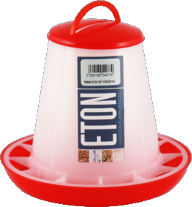 The Eco Feeder is a low cost feeder that is suitable for all classes of mature chickens. It has a deep trough with inward facing lip. It holds enough feed for 80 bird/days and is recommended for up to 25 hybrids (3 days). The Handy Feeder comes with a lid, legs and handle which can also be used to hang it off the ground. It also comes with fins in the deep feeding trough to help prevent feed being flicked on the floor. 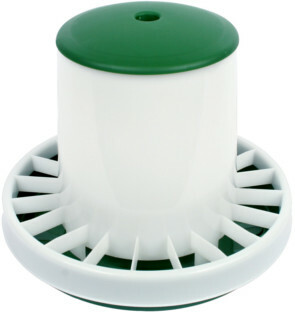 The feeder is infinitely adjustable to cope with all types of feed. The hanger and handle are made of very substantial plastic and are likely to last a lifetime without problems. The Handy Feeder will hold enough feed for 80 bird/days (hybrids) and is recommended for up to 25 hybrids (3 days). Galvanised, vermin-resistant all-weather feeder. Feed is only exposed when hens step on the treadle. New smooth treadle action eliminates unwanted noise as the treadle opens. A secure catch keeps the lid shut securely. Supplied flat packed for delivery or fully assembled if collected in store. Now with matching green body, pan and hat. 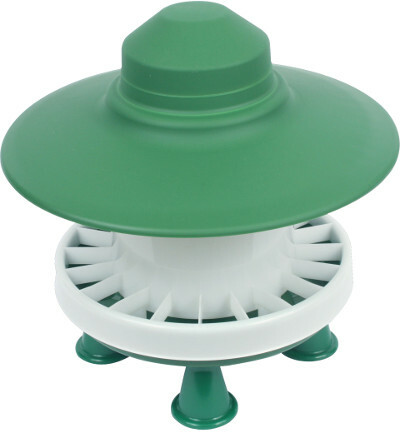 Adjustable outdoor feeder includes large 64cm hat and can be hung if required. It will hold enough feed for 170 bird/days (hybrids) and is recommended for up to 50 hybrids (3 days). 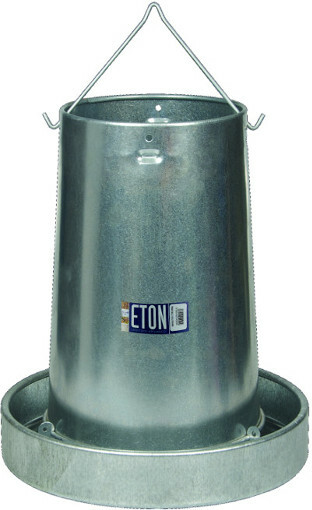 Eton/Gaun adjustable galvanised feeders. The 10 kg has the option of a large plastic rain hat and a plastic anti-flick ring (not shown). The 20 kg has the option of the anti-flick ring. The deep trough has an inward turned lip and in conjunction with the anti-flic which fits over the pan makes it impossible for birds to flick feed on the floor. The anti-flick ring has large holes that birds can easily get their heads through. We are very impressed with this feeder and are gradually replacing all our feeders with this model. 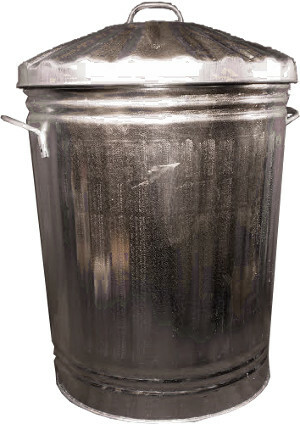 Ok, it’s a dustbin but it really does provide a very economical and vermin proof way of storing up to 2 un-opened 20 Kg bags of feed. It is water proof and so can store up 4 bags of opened feed poured in to the bin. It can be left out side but humidity will eventually affect the feed if it is stored loose for too long.